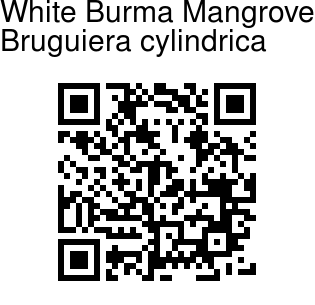 White Burma Mangrove is a tree gorwing up to 20 m tall with grey, smooth bark. Oppositely arranged leaves are light green, thin, elliptic. Stipules are pale yellow or greenish. Flowers are small in clusters of 2-5, with a pale greenish or white sepal cup that has 8 stout, long sepals. Petals are thin, white with 2-3 bristles at the tips. The petals turn brown rapidly. 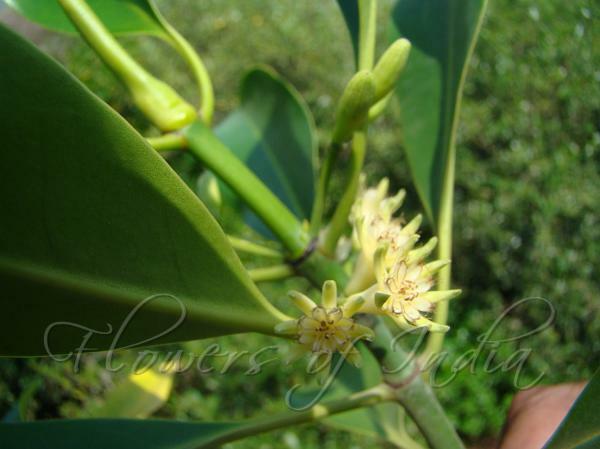 The small flowers are pollinated by day flying insects and butterflies. The petals of the flower hold loose pollen and are under tension. When probed at the base, the petal unzips to scatter a cloud of pollen over the head of the visiting insect. A closely related tree Burma Mangrove has red flowers. Identification credit: Shekhar Marathe, Dinesh Valke Photographed in Palghar, Maharashtra.